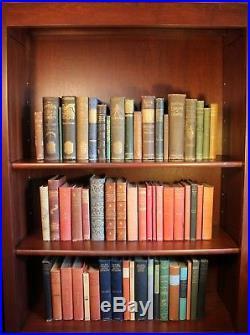 For sale is an unprecedented Mark Twain first edition collection. 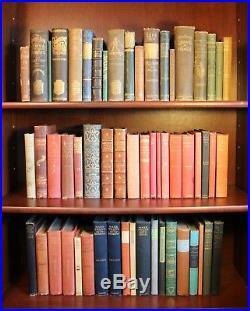 All 54 of the books in this Mark Twain set are first editions, first printings, and first issues. 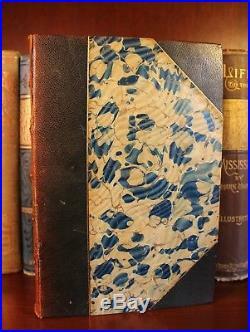 There is one book signed by Mark Twain, "The Innocents Abroad", a signed limited edition bound in leather, of which only 512 copies were made. 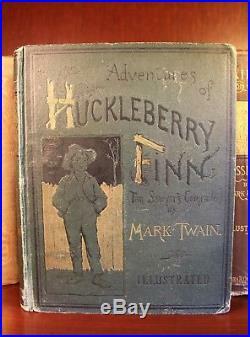 Other highlights include: "The Celebrated Jumping Frog of Calaveras County" Twain's very first book published in 1867, one of only 1,000 copies; "The Gilded Age" published in 1873, this being the only copy with all first issue points currently available online; "The Adventures of Tom Sawyer" published in 1876, the first UK edition which preceded the American publication by six months; "The Adventures of Huckleberry Finn" published in 1885; "A Connecticut Yankee in King Arthur's Court" published in 1889, a rare copy with all 3 first issue points present; and "Tom Sawyer Abroad; Tom Sawyer, Detective and Other Stories" published in 1896, one of only 1,000 copies of the first edition. Determining whether a Mark Twain book is a first edition, is a very difficult and tedious process. Listed below are the complete details of the 54 books included in the collection. The terms first issue and first state are used interchangeably. BAL is the acronym for Bibliography of American Literature, the most important reference guide for determining Mark Twain first editions. All of the books contain all of the additional first issue points not included in BAL, but discovered in later scholarship. The Celebrated Jumping Frog of Calaveras County and Other Sketches. First edition, first state (BAL 3310). Mark Twain, with his account of the jumping frog, produced the most famous tale in California history. This little gem of humor that introduced Mark Twains first book gave him international prominence. 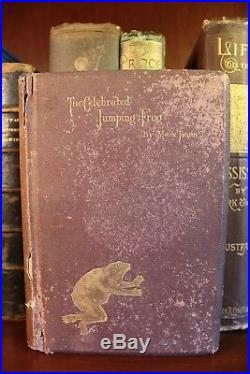 As his publisher, Charles Henry Webb, noted, By his story of the Frog, he scaled the heights of popularity at a single jump. A good only copy in the publishers original plum colored cloth, with moderate general wear. Board cloth is blotchy where rubbed, with small chips missing from the spine ends and extremities. Light foxing throughout, with heavier foxing at the front and rear blank pages. Rare, one of only 1,000 copies printed. Published by the American Publishing Company in 1869. First edition first issue (BAL 3316). Recased in the publishers original pictorial brown cloth binding, now in good condition. Gilt on front board and spine well preserved. Some paper loss to the edges of the end papers and preliminary pages. Edges and corners of textblock repaired with mending paper. Mark Twains (Burlesque) Autobiography and First Romance. Published by Sheldon & Company in 1871. First edition, first state (BAL 3326). Very good plus condition in the publishers original green blind-stamped decorative cloth, with gilt titling to the front board. Previous owners inscription dated May 6th 1884. Minor wear to the surface and edges of the boards. Small area of white staining to the middle of the rear board at the spine. Published by the American Publishing Company in 1872. First edition, first issue (BAL 3337). Very good plus condition in the publishers original black cloth pictorial boards. Hinges and edges of the boards professionally repaired with mending paper. Gilt lettering and illustrations on the front board and spine are very well preserved. Previous owners name on the front pastedown. Published by the American Publishing Company in 1873. First edition, first issue (BAL 3357). Small one inch stain at the bottom margin of the text block that runs from page 11 to page 19, not affecting any text. Christmas gift inscription on the front pastedown and second endpaper. Cloth boards are very well preserved with just minor wear at the corners. Gilt lettering and illustration on the front board bright. Spine is sun faded but the gilt lettering remains legible. Mark Twains Sketches, New and Old. Published by The American Publishing Company in 1875. First edition, first state (BAL 3364). Very good plus condition in the publisher's original full blue cloth boards. Front board and spine decoratively stamped in black and gilt, rear board decoratively stamped in black. Gilt lettering on front board and spine very well preserved. Spine edges and corners somewhat edgeworn. Some rubbing and light soiling to boards; front hinge starting; rear hinge cracked. Light toning with occasional soiling in text. This copy has a portion of the publisher's slip on page 299, denying Twain's authorship of "Hospital Days, " but the printed portion of the slip has been torn out, leaving just a stub; there is offsetting for the entire slip on pages 298 and 299. The Adventures of Tom Sawyer. Published by Chatto and Windus in 1876. First edition with 1876 on the title page and no later printings indicated (BAL 3367). This first edition was published in England, and preceded the American publication by about six months. Very good condition, quarter-bound in contemporary black leather over marbled boards, with gilt titling on the spine. Raised bands on the spine with marbled endsheets. The book is in very good condition. Rubbing and wear to the boards edges and spine ends. The first few leaves are toned and brittle with some small chips to the edge, and with a large tear to the front marbled endsheet. There is a previous owner's signature in ink on the front endpaper. The textblock is mostly clean and bright, the binding is sound. Published by Slote, Woodman & Co. First edition, first issue (BAL 3378). Very good condition in the publishers original green cloth binding with black illustrations on the front board and gilt lettering on the spine. Bumping to the corners and some wear to the cloth at the spine ends. Two crease marks on the front board. Published by the American Publishing Company in 1880. First edition, first issue (BAL 3386). Very good plus condition in the publishers original brown cloth blind-ruled and stamped in gilt with illustrations. Boards are very well preserved but exhibit minor surface wear. Bottom edges and the bottom of the spine are worn, exposing some of the cardboard underneath. Previous owners stamp on the front endpaper. Hinges are tight, book appears to be unread. The Prince and the Pauper. Osgood and Company in 1882. First edition, first issue (BAL 3402). Very good condition in the publishers original illustrated green cloth, stamped in gilt. The cloth has some fraying at the edges with some scattered rubbing. The hinges are tight and intact, the textblock appears to be well handled and read, but well-preserved. Good plus condition in the publisher's original tan pictorial cloth binding. Repairs to the spine and board edges. First edition, first printing, and first state (BAL 3411). A very good copy in the publishers original decorated cloth with black stamped decorations and gilt pictorial vignettes. Minor surface wear and staining to the boards, but the gilt lettering remains relatively bright and legible. Hinges cracked, but appear to have been re-glued and are holding strong. Previous owners inscription from September 1984 on the front endpaper in pencil. The Adventures of Huckleberry Finn. Webster & Company in 1885. First edition, first printing of perhaps the most bibliographically complex book ever produced (BAL 3415). Very good condition, bound in the publishers original green pictorial gilt cloth. Minor to moderate surface wear to the boards, moreso to the spine ends and corners, where some of the cloth has worn away. Both hinges cracked and seem to have been professionally repaired internally. No previous owners marks, but some erasure evidence on the front endpaper. Tissue guard to frontispiece is wrinkled and with the lower left edge chipped. English as She is Taught. Very good minus condition in the publishers original brown textured snakeskin patterned cloth. Binding sound but moderately soiled. A contemporary newspaper review of this work tipped-in on rear endpaper. Front free endpaper damaged and partly stuck down on front pastedown. Mark Twains Library of Humor. Published by the Charles L. Very good minus condition in the publishers original brown pictorial cloth boards with gilt lettering on the front board and spine. Rubbing and wear to hinges, spine ends, rear board, and corners. Internal repairs to both hinges. A few splits to binding internally, but all pages remain securely bound. Bookseller stamp to rear free endpaper. A Connecticut Yankee in King Arthurs Court. Webster & Company in 1889. First Edition, First Printing, First State (BAL 3429). A good copy in the publishers original green cloth, with black stamped decorations and gilt pictorial vignettes. Both hinges cracked, but holding strong. Remnants of removed bookplate on the front pastedown. Moderate wear and staining to the cloth boards. Cloth worn through to the cardboard underneath at the corners and at the top and bottom of the spine. Very good plus copy in the publishers original olive-green cloth with gilt lettering and black illustrations to the front board and spine. Minor wear to the edges of the spine and to the extremities. Gilt lettering surprisingly well preserved. Previous owners name and date on the front endpaper in pencil. First edition, first issue (BAL 3435). Very good plus condition in the publishers original gray-green cloth with gilt lettering to the front board and spine. Light bumping and wear to the corners of the boards and to the spine ends. Gilt lettering dulled but legible. Some wrinkling and minor foxing to the title page and preliminaries. Webster & Company in 1893. Very good condition in the publishers original tan decorative cloth. Minor rubbing to the extremities, with some light surface wear. There is a small line staining at the bottom-right corner of the front board. Antiquarian private library bookplate on the front paste-down. The binding is strong and tight, the text is clean and unmarked, and the boards remain bright, colorful and distinct. Webster & Company in 1894. First edition, first state in the first state binding (BAL 3440). A very good minus copy in the publishers original tan cloth boards. Boards moderately soiled, and with wear exposing the cardboard at the corners and spine ends. Front hinge is cracked, rear hinge is starting. The Tragedy of Puddnhead Wilson. Published by the American Publishing Company in 1894. First edition, first issue (BAL 3442). Near fine copy with the gilt lettering very well preserved. Wear to the corners and the tail of the spine. Pages are clean, bright and tight. The date 1896 is written in ink in longhand on the front endpaper. Personal Recollections of Joan of Arc. Published by Harper & Brothers in 1896. First edition, first state (BAL 3446). Near fine condition in the publishers original decorative red cloth with gilt and silver vignette on the front board. The gilt on the spine is mostly faded. Interior is fine, but with some separation starting at the title page. Tom Sawyer Abroad; Tom Sawyer, Detective and Other Stories. First edition, first state (BAL 3447). One of Twains rarest first editions, with only 1,000 copies printed. A good minus copy with wear, soiling, and staining to the publishers original red cloth boards. Cloth loss and chipping to the spine ends. Spine has darkened with age but the gilt titling is still legible. Front endpaper is loose, and has a previous owners signature. A rare copy despite its flaws. How to Tell a Story and Other Essays. Published by Harper & Brothers Publishers in 1897. First edition, first printing (BAL 3449). Very good minus condition in the publishers original red cloth boards with gilt embellishments. Boards and spine moderately dulled and soiled, with the font a bit rubbed to background color of title panel. Minor wear to the extremities, gilt on top edge of the textblock has a scuff spot; spine very slightly cocked; hinges tight; ownership inscriptions on front end paper dated 1901 and 1950; pages excellent condition otherwise. Published by The American Publishing Company in 1897. First edition, first state (BAL 3451). Very in good in the publishers original navy blue cloth. Minor to moderate surface wear to the boards. 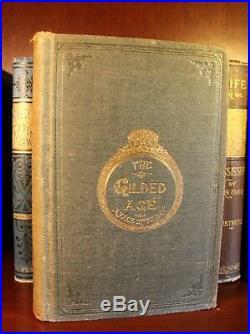 Some scratching to the gilt pictorial illustration on the front board and spine lettering. Minor soiling to the first few pages of the book. Previous owners name in pen on the front pastedown. Published by The American Publishing Company in 1899. Very rare signed limited edition, signed by Mark Twain on the limitation page, this copy being number 302 out of 512 copies (BAL 3456). Both volumes expertly bound in contemporary half leather with marbled boards. Very good or better condition with the gilt titling and decorations well preserved on the spine. Minor wear and rubbing to the marble boards and leather, most noticeably a two inch split to the front hinge at the top of the spine. Both volumes present very well. The Man That Corrupted Hadleyburg and Other Stories and Essays. Published by Harper & Brothers in 1900. Very good condition in the publishers original gilt-stamped red cloth binding. The spine is slightly slanted and is sunned, with the spine lettering faded but legible. The rear hinge is cracked. Unmarked and in an otherwise sound binding. A Double Barrelled Detective Story. Published by Harper & Brothers Publishers in 1902. Exterior in near fine condition in the publishers original red cloth boards with title on front cover in intaglio on a gold field. Bookplate on the front pastedown, previous owners stamp, name and date on the second end paper. Published by Harper & Brothers in 1904. First edition, first state (BAL 3480). Bound in the publishers original pictorial red cloth. A near fine copy with the white text and illustration on the front board very well preserved, with some wear and fading to the text on the spine. A minor bump to the bottom of the front board. Interior is unmarked and in fine condition. First edition, first state (BAL 3483). Bound in publisher's original decorated red cloth covered boards. A very good copy with the white lettering on the spine faded but legible. Light chipping to the illustration of the dog on the front board, light even soiling to the red cloth boards. Published by Harper & Brothers in 1906. First edition, first state (BAL 3489). Very good plus condition in the publishers original red pictorial cloth with white titling. Minor sun-fading to the spine and minor wear to the white lettering. The interior is fresh and well-preserved, with no previous ownership marks. Small stain to the fore-edge of the textblock. Published by Harper and Brothers in 1906. First Edition, first state (BAL 3492). Minor soiling to the spine, gilt lettering slightly faded. Published by Harper & Brothers in 1907. First edition, first issue (BAL 3497). Very good minus condition in the publishers original gilt-stamped red cloth boards. Gilt design on front board very well preserved, gilt titling on spine very legible but slightly faded. Bookplate from the public library of Cincinnati, from being donated to their Mark Twain collection in memory of Michael Flaig by his parents. Previous owners name in pencil on the front end paper. Otherwise interior is very good and likely unread. First edition, first state (BAL 3500). Very good condition in the publishers original pictorial red cloth. Horse illustration on front board very well preserved. Spine lightly sun-faded and with the white titling partially rubbed though still legible. Tissue guard and frontispiece lightly foxed, else interior near fine. Published by Harper & Brothers in 1909. First edition, first issue (BAL 3509). A very good copy bound in the publishers original green cloth with gilt titling on the front board and spine. The gilt is bright and well preserved. The cloth boards are worn through at the corners and spine ends, and there is minor wear and a few unobtrusive stains on the boards. The spine has darkened with age. Extract From Captain Stormfields Visit to Heaven. Published by Harper & Brothers Publishers in 1909. Very good condition, bound in the publishers original red cloth boards with image of Captain Stormfield mounted on his globe-like airship on the front board. Minor wear and soiling to the boards. White titling on spine faded but legible. Published by Harper & Brothers in 1910. Spine sun-faded and lightly foxed, edges of the textblock lightly foxed as well. Published by Harper & Brothers Publishers in 1916. First edition, first issue (BAL 3520). Very good copy bound in the publishers original black cloth with pasted illustration of a wizard on the front board. Wear to the corners and the top and bottom of the spine. Cloth at the top front of spine is split, and a small chip is missing at the bottom spine but not affecting the publishers lettering. Published by Harper & Brothers Publishers in 1917. Very good minus condition in the publishers original gilt-decorated red cloth boards. Minor wear and soiling to the boards, with a small stain to the top left of the front board. The spine is sun-faded with and has some minor staining. Previous owners name on the front end paper and pastedown. Arranged with Comment by Albert Bigelow Paine in Two Volumes. Very good condition in the publishers original red cloth with gilt lettering on the spine, and the top edges gilt. Front board of Volume 1 has moderate but unobtrusive staining. Interior of both volumes clean and well-preserved. The Curious Republic of Gondour. Published by Boni & Liveright in 1919. Very good plus condition in off-white cloth spine with rough tan paper covered boards. Titled in black on spine and front cover. Previous owners name to front endpaper dated 1940, else clean. Published by Harper & Brothers in 1923. Spine somewhat darkened and dulled, else tight and well-preserved. Published by Harpers & Brothers Publishers in 1924 in two volumes. First edition, first issue (BAL 3537). Near fine condition in the publishers original navy cloth with gilt facsimile signature on the front board and title and book information on spine. Both volumes are extremely well preserved. The gilt lettering on the front boards and spines are fresh and bright. The bindings are tight and there are no previous ownership markings. Sketches of the Sixties by Bret Harte and Mark Twain. Published by John Howell in 1926. A near fine copy in the original tan laid paper boards sides, with a brown-orange cloth spine and printed paper label on spine. Very minor wear to the boards. Some bumping to the spine ends and corners of the boards. The Adventures of Thomas Jefferson Snodgrass. Pubished by Pascal Covici in 1928. Limited to just 375 copies, this one numbered 112 (BAL 3544). Very good plus condition in the publishers original brown laid paper boards with a tan buckram spine, with printed paper labels on the spine and front cover. Minor shelf wear to the boards, some bumping and wear to the extremities. Interior very well preserved and likely unread. Published by Harper & Brothers in 1935. Very good condition, in the publishers original navy cloth, with a gilt facsimile signature on the front board and title on the spine. Gilt lettering bright and well-preserved. Edges of textblock and preliminary pages have scattered foxing. Previous owners bookplate on the front pastedown. Letters from the Sandwich Islands. Written for the Sacramento Union. Published by The Grabhorn Press in 1937. Near fine condition in the publishers original green cloth with blue-gray buckram-like spine. Very minor bumping to the corners. The Washoe Giant in San Francisco. Published by George Fields in 1938. Near fine condition in the publishers original printed green rough paper boards, with green printed paper label on a black spine. Boards have minor shelf wear, particularly to the lower corners and the bottom of the spine. Minor offsetting to the endpapers. Mark Twains Travels With Mr. Brown, Being Heretofore Uncollected Sketches. Published by Alfred A Knopf in 1940. Limited to just 1,795 numbered copies, this book being copy 260. Near fine condition in the publishers original blind-stamped green cloth with gilt lettering and illustrations on the spine. Minor white stain to the lower front right board, else fine. Gilt lettering and illustrations on spine bright and well preserved. Hitherto Unpublished Pages about Men and Events. Published by Harper & Brothers Publishers in 1940. Very good plus condition in the publishers original terra-cotta imitation buckram. Very minor wear and staining to the boards, with the spine lettering partially rubbed. Old bookstore label on the front end paper, otherwise near fine. Edited by Samuel Charles Webster. Published by Little, Brown and Company in 1946. Near fine condition in the publishers original light blue cloth boards. Offsetting to the front endpaper from a newspaper clipping. Minor bumping to the corners, else fine. Mark Twain: The Letters of Quintus Curtius Snodgrass. Published by the University Press in Dallas Southern Methodist University in 1946. Fine condition in the publishers original salmon colored cloth with gilt titling to the spine. Some offsetting to the front end paper and pastedown. Published by the Huntington Library in 1949. Fine condition, in the publishers original dark green buckram. The Love Letters of Mark Twain. Published by Harper & Brothers in 1949. Very good minus condition in the publishers original dark blue cloth with Mark Twains signature blind-stamped on the front board and gilt titling on the spine. Spine lettering partially faded but mostly legible. Minor wear to the corners and spine ends. Stain on the lower rear pastedown and endpaper. 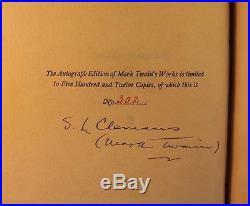 The item "Mark Twain First Edition Set Collection Signed 1867-1949 Huckleberry Finn Rare" is in sale since Tuesday, January 29, 2019. This item is in the category "Books\Antiquarian & Collectible". The seller is "ernestoic" and is located in Buffalo, New York. This item can be shipped worldwide.